names.nsf file resides in Notes? Lotus Notes is a collaborative application of Clients and Server that's why it comes under the category of preeminent Email Clients used for several purposes like Emailing, Schedule Meetings and many more. It consist the set of enormous attributes like Email, Contact, Calendar, Task and Journals and saves its entire database in .nsf format. Names.nsf file or Address Book is made up at both the places Lotus Notes Client as well as Domino Server. Names.nsf file is the most significant file among the all and automatically created on client as well as on server when Lotus Notes is installed on the machine. It can be used to store personal as well as professional information in a structured manner. User can send mail directly means no need to type or remember id of the individual. User can Search any required information about individual. User can Edit, Delete, Insert and apply various commands on this Contact file. Lotus Notes doesn't impose any restriction regarding the storage of contacts in Address Book. Now the question arise what type of format it is used when the files are saving in the machine. Yes all the files of unlimited user that are belonging to one's contact information in Lotus Notes are saved in names.nsf file. The names.nsf file at server side called as Domino Directory. As we all know that server entail an authentic id to work as it provides the uniqueness of your identity. Names.nsf is the utmost imperative file that the Domino Server contains. Here all the authorities' information of Lotus Notes User is involved in one file that is names.nsf. 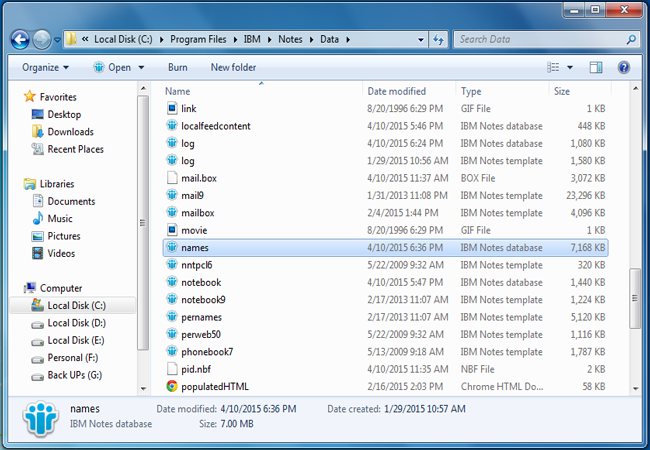 Ids of Lotus Notes User and a lot more.